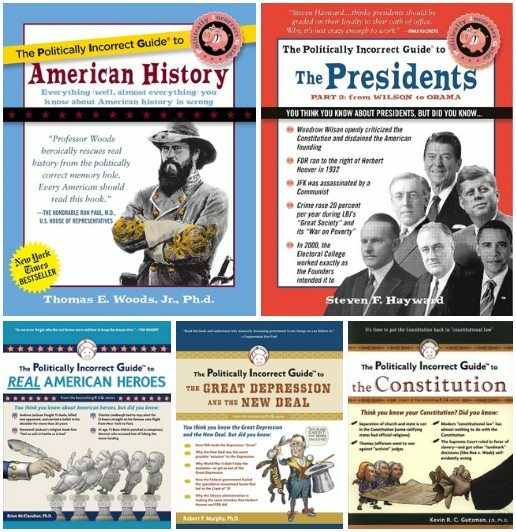 1) The Politically Incorrect Guide to American History - Thomas E. Woods Jr. Most Americans trust that their history professors and high school teachers will give students honest and accurate information. The Politically Incorrect Guide to American History makes it quite clear that liberal professors have misinformed our children for generations.Professor Thomas E. Woods, Jr. takes on the most controversial moments of American history and exposes how history books are merely a series of clichés drafted by academics who are heavily biased against God, democracy, patriotism, capitalism and most American family values.From the real American “revolutionaries” to the reality of labor unions, The Politically Incorrect Guide to American History is all you need for the truth about America—objective and unvarnished. • Was understood by the founders who wrote it and the people who ratified it. • Follows the Supreme Court as it uses the fig leaf of the Constitution to cover its naked usurpation of the rights and powers the Constitution explicitly reserves to the states and to the people. • Slid from the Constitution's republican federal government, with its very limited powers, to an unrepublican "judgeocracy" with limitless powers. • How the Fourteenth Amendment has been twisted to use the Bill of Rights as a check on state power instead of on federal power, as originally intended. • The radical inconsistency between "constitutional law" and the rule of law. • Contends that the judges who receive the most attention in history books are celebrated for acting against the Constitution rather than for it.